I can hardly believe that I haven't posted anything on this blog since 2011. The development on Creative Docs .NET has come to a halt. Several attempts at opening up the sources have failed: converting a closed source project to something that anyone can look into requires more thought and energy than what I expected. Being the CEO of Epsitec and having to manage a 20-person team is currently incompatible with me doing personal projects. I prefer to spend my spare time with my family. Nevertheless, I started blogging again. Head over to code.fitness to see what's keeping me busy. The 3.3.6 release is just a bug fix release. We are currently working on several projects, all built on the same underlying framework and we can't devote time to improve Creative Docs .NET for now. A few months ago, the company sponsoring the development of Creative Docs .NET, decided to acquire the full source code and ownership of Window Clippings. Its author, Kenny Kerr, was seeking someone who would take over the project. I had since long wanted to get access to the amazing technology behind Window Clippings, so that we could, in a hopefully not too distant future, integrate it with Creative Docs .NET. The 3.0.3 release fixes a minor startup problem, which caused Creative Docs .NET to hang if there was no network connection or if the connection could not be established with www.creativedocs.net. I am terribly sorry: I introduced a regression in the 3.0.1 release which needed immediate attention. For those of you who updated to 3.0.1, please download and install the 3.0.2 release. Internally, a .CRDOC file is just a plain ZIP file, with several components: the document data, a preview, images and possibly some embedded fonts. We are relying on the open source #ziplib library to read and write the file. In the process of migrating our whole source tree, we upgraded also the version of #ziplib, not realizing that some subtle implementation details changed. I still do not know if I have hit a bug in #ziplib 0.86.0.518 or if it is an error in the way I use it which was at the root of the problem. For the curious, the ZIP file format consists of the concatenation of file entries, followed by a general directory at the end of the file. Every file entry can specify the raw and compressed size of the associated file data. The broken version of Creative Docs .NET somehow generated files where the compressed size was not properly specified. #ziplib therefore cannot naturally move from one item to the next, and as a result, the extraction fails. Curiously, Windows still manages to open the broken .CRDOC files (after they have been renamed to .ZIP). I suspect it uses the general directory to access the file entries when the compressed size is not available in the file entries. Basically, we have ripped out the tightly integrated FreeImage library, which was in charge of image decoding and encoding. For some obscure reasons, we never managed to get a 100% stable application when lots of images were involved, probably because of some imperfect error handling code in FreeImage (or one of its components) when memory becomes a scarce resource. We now switched to the imaging engine provided by Microsoft with WPF and the .NET 3.5 framework. Our tests have shown that the new image engine is very stable. Some file formats are no longer supported, such as TIFF files with four channel CMYK color and an additional alpha channel. We also reworked the code involved when generating ICO files from Creative Docs .NET documents. A few users complained that this was a frequent cause of crashes. This should no longer be the case. In any case, please let us know if your experience with Creative Docs .NET has improved or not (as always, e-mail to bugs at creativedocs.net). Here is a new, uninteresting, bug fix release of Creative Docs .NET. Download the 2.4.7 release. I've played with Creative Docs .NET 2.4.7 on Windows 7 and everything went smoothly, which should not be a real surprise, given the fact that Windows 7 is more or less a service release of Vista, sold as something new by the marketing department (that's not really fair, I know, as there are plenty of small improvements in the product, but yet, I don't feel that it deserved being called "7"; I'd have voted for "6.5", to stay in line with VMware Workstation) . The blog is up and running again; our provider upgraded the installed PHP and this broke the old version of Serendipity I was using. It took me a few days to find the time to fix this. And while I was at it, I spent a few hours chasing small bugs in Creative Docs .NET. I've finally decided to ship the release build of Creative Docs .NET. Check out the 2.4.4 release. It should be a bit faster than the previous versions... Let me know of what you think. Can you feel the speed improvement? I made a mistake while deploying the build of the 2.4.2; I hope that you have not been too many to try it out on top of 2.4.1. The current version is now the 2.4.3 release. The middle mouse button can now be used to pan around a document. This behaves just like the hand tool, but without having to change tools. The German version works better (i.e. it no longer crashes when trying to open a document for the first time, looking for a non existent folder). Fixed several issues with fonts and font handling. Even on machines with several thousand fonts, Creative Docs .NET now starts properly without exhausting the computer's resources first. Fixed the interaction with the quick toolbar (open the global settings by pressing F5 and switch to the Buttons tab, check the commands you often need to have them always available at the top of the window). I decided to skip version 2.3.1 which was available in French only (see the EPSITEC web site if you are looking for a French version, named CrÃ©sus Documents, but basically the same as Creative Docs .NET). Daniel improved the page and layer thumbnails and included drag and drop to reorganize them; pressing the CTRL or SHIFT key while dragging a thumbnail creates a copy of the page or layer. To speed things up, the miniatures are regenerated asynchronously. Zooming with the scroll wheel has also become much more intuitive. The point of focus for the zoom is now always under the mouse; you no longer need to think about how Creative Docs .NET will zoom the document in and out: point and zoom, done. Scaling arrows and rounded corners maintains the propoprtions. And for all of you who are still using Windows 2000, I finally fixed the problem which prevented Creative Docs .NET to start on Windows 2000. For the programmers, a small hint: the SHELL32.DLL is said to export ILCombine and others, starting from version 5.00 of the DLL, yet in my experience, this is not always the case on Windows 2000 SP4. Some users on the net solved the problem by importing the entry point using [DllImport("shell32.dll", EntryPoint="#25")], but this did not work for me. So I reimplemented the missing IL functions in C#. 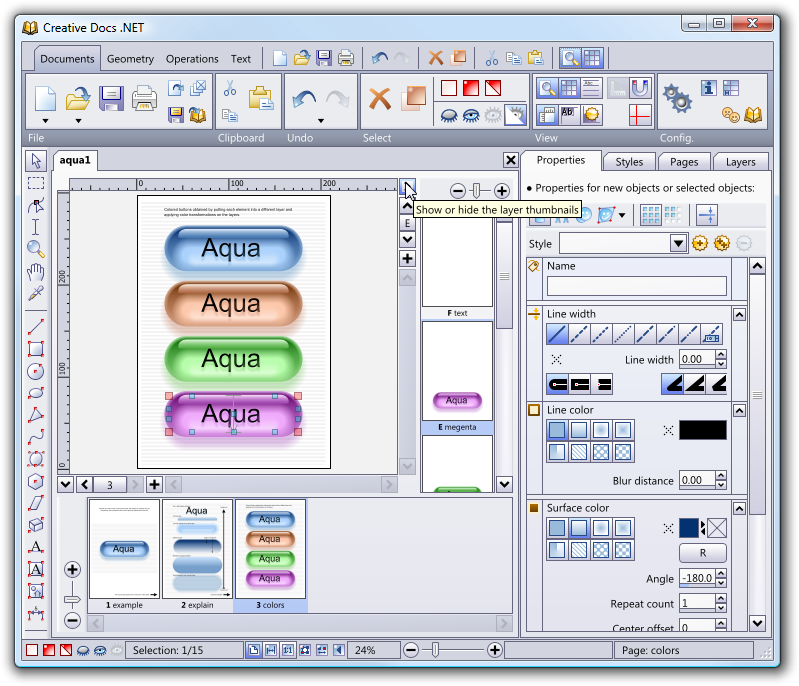 Automatic layer thumbnails for the active page (click on the small arrow near the top of the scroll bar, at the right of the document). Automatic page thumbnails for the active document (click on the small arrow near the left of the scroll bar, at the bottom of the document). Improved zooming with the scroll wheel; turning the mouse wheel will zoom in and out without moving the document around, if this is possible. Point the mouse to where you want to zoom in and turn the wheel. Thanks, Daniel! As always, let me know if you have any issues with this release; use the e-mail address bugs at creativedocs.net.